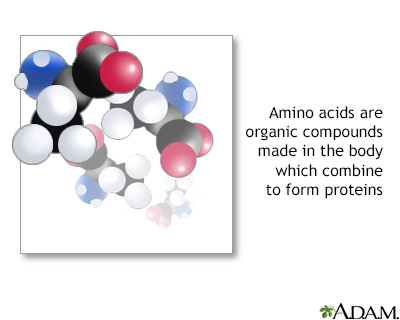 Amino acids are organic compounds that combine to form proteins. Amino acids and proteins are the building blocks of life. Amino acids can also be used as a source of energy by the body. Essential amino acids cannot be made by the body. As a result, they must come from food. The 9 essential amino acids are: histidine, isoleucine, leucine, lysine, methionine, phenylalanine, threonine, tryptophan, and valine. Nonessential means that our bodies produce an amino acid, even if we do not get it from the food we eat. Nonessential amino acids include: alanine, asparagine, aspartic acid, and glutamic acid. Conditional amino acids are usually not essential, except in times of illness and stress. Conditional amino acids include: arginine, cysteine, glutamine, tyrosine, glycine, ornithine, proline, and serine. You do not need to eat essential and nonessential amino acids at every meal, but getting a balance of them over the whole day is important. A diet based on a single plant item will not be adequate, but we no longer worry about pairing proteins (such as beans with rice) at a single meal. Instead we look at the adequacy of the diet overall throughout the day. Food and Nutrition Board, Institute of Medicine of The National Academies. Dietary reference intakes for energy, carbohydrate, fiber, fat, fatty acids, cholesterol, protein and amino acids. The National Academies Press; 2005. www.nal.usda.gov/sites/default/files/fnic_uploads/energy_full_report.pdf. Nagai R, Taniguchi N. Amino acids and proteins. In: Baynes JW, Dominiczak MH, eds. Medical Biochemistry. 4th ed. Philadelphia, PA: Elsevier Saunders; 2014:chap 2. Amino acids are either essential, which must be supplied by food, or nonessential, which are made in the body.